An as-close-as-it-could-get reskin attempt of HK-47; based on a splendid artwork called "Hk47 Wip" by uncannyknack. I managed to edit the looks of HK-47's in-game freecam filter too, so it doesn't look all red anymore [to fit them new eyes too] and with the assumption that HK-47 had all the resources to process the almost-perfect true color; close to human eye capability. 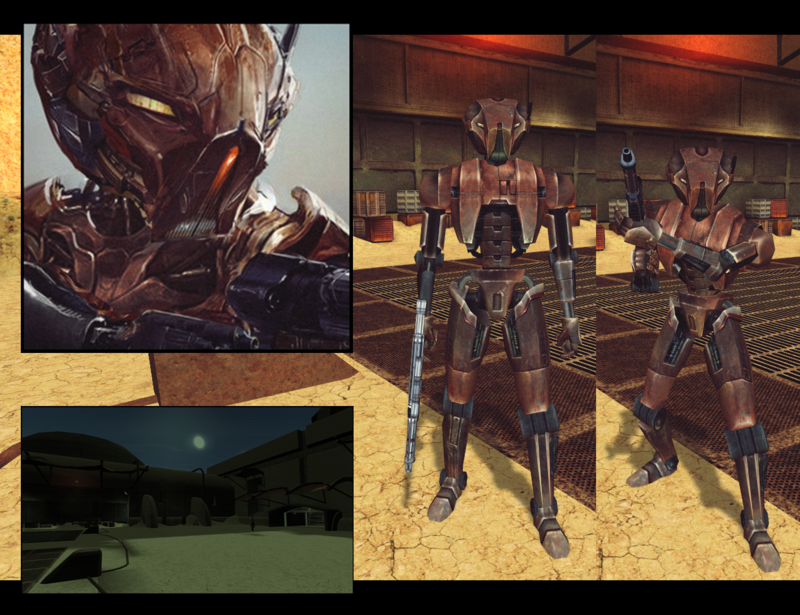 The vanilla texture I am using on this attempt is the amazing Quanon's "HK-47 Reskin". This reskinned HK-47 texture is currently used for personal playthrough only. HK-47; was a Hunter-Killer assassin droid & Jedi hunter constructed shortly after the end of the Mandalorian Wars in 3969 BBY. I admire how you do portraits and also the profile. I'd admire to see our portrait for Benkins someday in galleries to show fans what our future will be with the new companion.